Again, too soon to ask for a Texas rainmaker? the Windward Islands and the offshore islands of northern Venezuela. Above: Infrared GOES-16 satellite image of Tropical Storm Harvey as of 1700Z (1 pm EDT) Friday, August 18, 2017. GOES-16 data are preliminary and non-operational. Image credit: NASA/MSFC Earth Science Branch. Even as a minimal tropical storm (top sustained winds of 40 mph), Tropical Storm Harvey rocked parts of the Windward Islands with high surf, gusty winds, heavy rain, and flooding. As of 11 am EDT Friday, Harvey was located about 15 miles south-southwest of St. Vincent and about 50 miles south-southwest of St. Lucia. Both of those islands experienced the stronger northwest side of the storm. Harvey’s center also passed just south of Barbados, where flooding has been reported, including in the Speightstown area of northern Barbados (see embedded tweet below, via Eric Blake). Figure 1. Tropical Storm Harvey as seen in a mosaic of radar data from Guadelope and Martinique at 1345Z (9:45 am EDT) Friday, August 18, 2017. 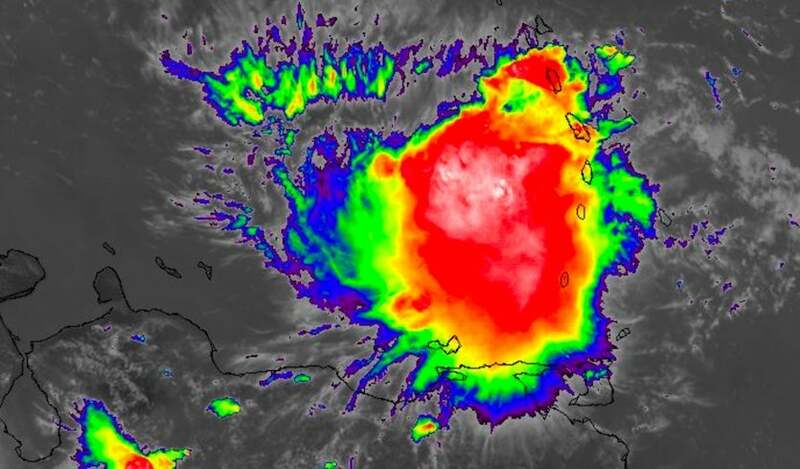 The most intense rains, which passed over Barbados early Friday, were about to move westward out of St. Lucia at the time of this display. Image credit: Meteo France. Wind shear has kept Harvey’s strongest showers and thunderstorms (convection) displaced to the west of the storm center, so most of the heaviest rains preceded the arrival of Harvey’s center. The storm is moving west at a fairly rapid clip, about 21 mph, and conditions across the Windward Islands were improving rapidly by midday Friday. Meanwhile, Harvey was continuing to expand its upper-level outflow and its shield of strong convection, an impressive sign of strength in the face of persistently strong wind shear and midlevel dry air (see below). Harvey should steer clear of land areas for the next couple of days as it charges quickly westward. Computer models are in strong agreement that Harvey will traverse the entire Caribbean through the weekend. The major track question is how far north or south Harvey will be by the time it reaches land. If the track remains on the south side of model guidance (as suggested by the 0Z Friday UKMET run and most members of the GFS ensemble run), then Harvey will likely track along or near the Honduras coast on Monday and arrive in Belize around Tuesday. 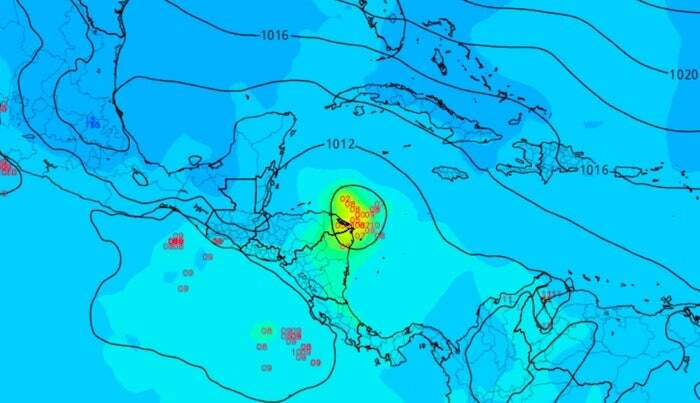 If Harvey stays toward the north side of guidance (as indicated by most members of the European model ensemble from 0Z Friday, and by the operational GFS run from 12Z Friday), it would remain just north of Honduras and would make landfall late Monday or Tuesday in Belize, or perhaps the Yucatan coast of Mexico. Harvey will continue to battle strong wind shear of 15-20 knots from the northeast and north through Saturday. This will keep the storm’s convection somewhat asymmetric and inject dry air into the storm, so it is unlikely Harvey will strengthen dramatically, although some intensification is quite possible. Around Sunday, models indicate a brief window of reduced wind shear, and midlevel relative humidities should jump from around 45-50% to 70% or more. Together with very warm waters (sea surface temperatures of 29-30°C, or 84-86°F), this will give Harvey a window of potential for more rapid strengthening before it reaches Central America. None of the GFS or European ensemble members from 0Z Friday made Harvey a hurricane before landfall—nor did the 0Z and 6Z Friday runs of the HWRF, our top intensity model. Nevertheless, Harvey bears close watching for any signs of strengthening more quickly than models expect, especially on Sunday. Harvey’s post-landfall future depends greatly on the angle of its track early next week. The more northerly European model solutions—including the 0Z Friday operational run—indicate that Harvey could get pulled northwestward through the western Gulf of Mexico, while the 0Z Friday GFS ensemble members and operational run keep Harvey moving west-northwest across the southern Bay of Campeche and into the east coast of central Mexico, similar to the track of Hurricane Franklin earlier this month. The more northward solutions would give Harvey a better chance of intensifying in the Gulf, and potentially affecting the western Gulf Coast a week or more from now; the southward solutions imply very heavy rainfall across parts of southern Mexico and Central America. Above: Visible-wavelength GOES-16 image of Tropical Storm Harvey at 1530Z (11:30 am EDT) Saturday, August 19, 2017. Northwesterly wind shear is blowing the tops off of Harvey’s showers and thunderstorms, as seen in the tendrils extending southeastward from the disorganized storm. GOES-16 data are preliminary and non-operational. Image credit: RAMMB/CIRA @ CSU. Time has not been kind to Tropical Storm Harvey, which entered the Caribbean as a minimal tropical storm on Friday. Hurricane Hunters were unable to find a closed circulation within Harvey at the 850 mb level (about a mile high) on Saturday morning. Because a closed circulation was found near the surface, the National Hurricane Center kept Harvey classified as a tropical storm at 11 am EDT Saturday. That may be generous, as no winds above tropical-storm strength (35 knots) were found at flight level by the Hurricane Hunters. Continuity may be a factor in keeping Harvey a tropical storm, since it is likely to move into a more nurturing environment later this weekend. Figure 1. 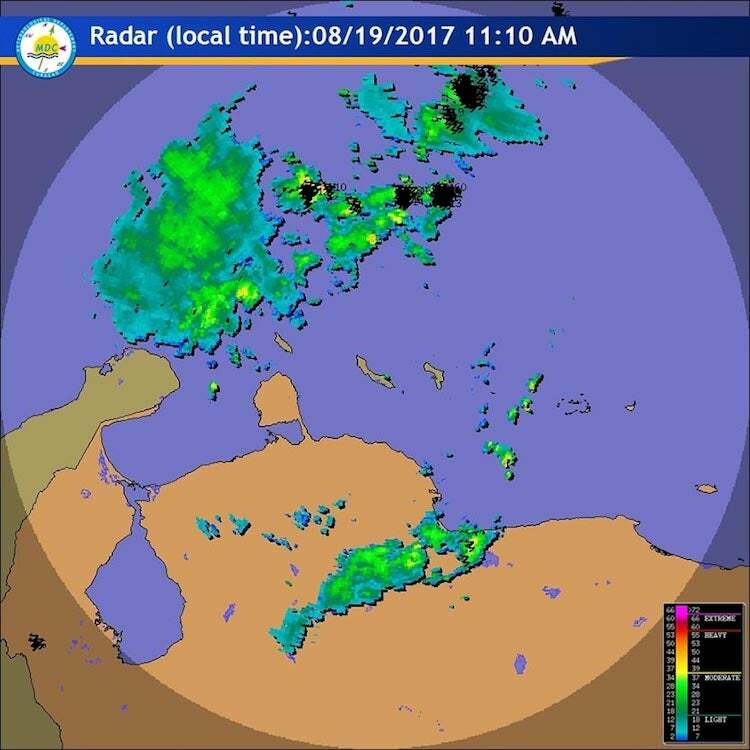 Radar image showing the disorganized rain showers of Tropical Storm Harvey at 11:10 am EDT August 19, 2017. Lightning strikes are shown as black squiggles. 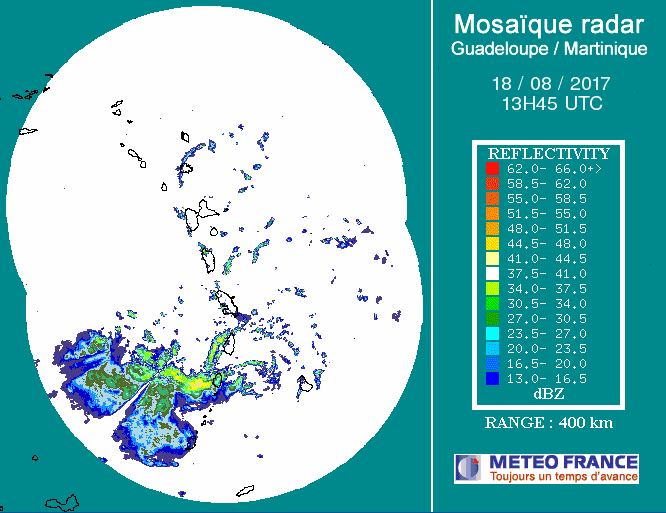 Image credit: Meteorological Department of Curacao. Located about 125 miles north-northeast of Curacao at 11 am EDT Saturday, Harvey was racing westward at 22 mph. Harvey’s envelope of convection (showers and thunderstorms) had become much more fragmented and elongated, a byproduct of the storm’s rapid motion coupled with persistently strong wind shear of 20-25 knots. It is possible Harvey will be stretched to the point where it loses its closed surface circulation and becomes an open wave by late Saturday. Assuming Harvey survives till Sunday, it will be moving into the western Caribbean, where wind shear is predicted by the 12Z Saturday SHIPS model to drop to the 5-10 knot range. Mid-level relative humidity should increase from around 50% to greater than 70%. This will give Harvey a much more supportive environment for strengthening. Sea-surface temperatures will remain quite warm along Harvey’s path, around 29°C (84°F)—roughly 0.5°C above average. These warm waters are quite deep, providing ample oceanic heat content to enhance strengthening if Harvey does remain a tropical cyclone. 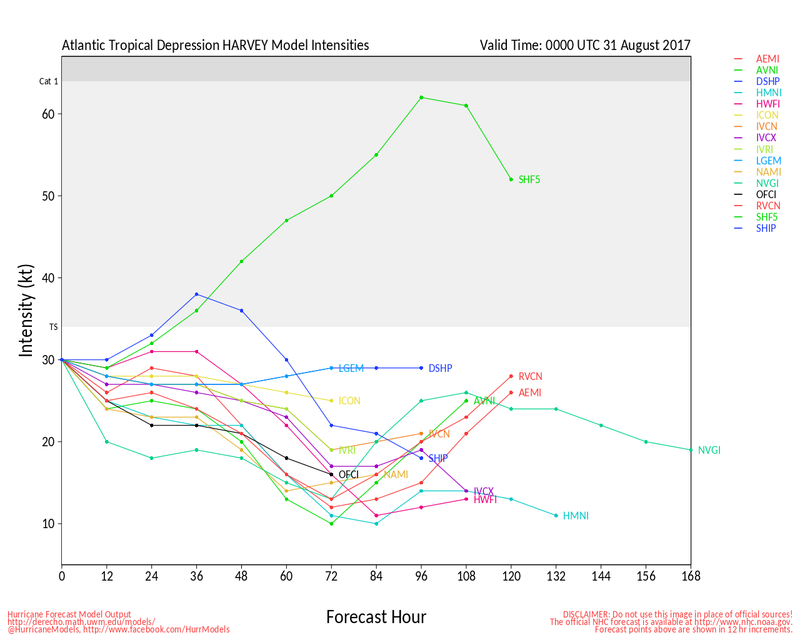 The leading global models are in fairly good agreement on Harvey’s general track over the next 3-5 days, but subtle shifts could make a big difference in Harvey’s strength and long-term future. Most of the ensemble members from the 0Z Saturday runs of the GFS and European models take Harvey near or just north of the Honduras coast on Monday, with a landfall late Monday or Tuesday in Belize or Mexico along the east coast of the Yucatan Peninsula. A few ensemble members bring Harvey into far northern Nicaragua or eastern Honduras, in which case Harvey would likely weaken and might never reach the Yucatan. The official NHC forecast from 11 am EDT Saturday tracks Harvey into Belize as a strong tropical storm on Tuesday morning. Figure 2. Central pressure of Harvey at 8:00 am EDT Monday, August 21, as projected by the 6Z Friday run of the GFS ensemble modeling system. Each pair of red numerals denotes the location of Harvey’s center and the last two digits of Harvey’s central surface pressure, in millibars. Image credit: tropicaltidbits.com. The bulk of track guidance brings Harvey into the southern Bay of Campeche by midweek. Although it would be a weak tropical storm at best by that point, Harvey would get another chance to reintensify. It may also be tugged northward by a weak upper-level trough that will move west across the Gulf of Mexico next week. As a result, Harvey’s track could angle more to the northwest with time, with a gradual slowing in forward speed. This slowdown and the uncertainty in steering flow add a great amount of uncertainty to Harvey’s future should it reach the western Gulf later next week. northwestern Caribbean Sea during the next couple of days. northwestward at about 15 mph. A. BEGIN 6-HRLY FIXES ON HARVEY AT 20/2330Z NEAR 14.5N 78.0W. PUERTO RICO NEAR 21.5N 66.0W. 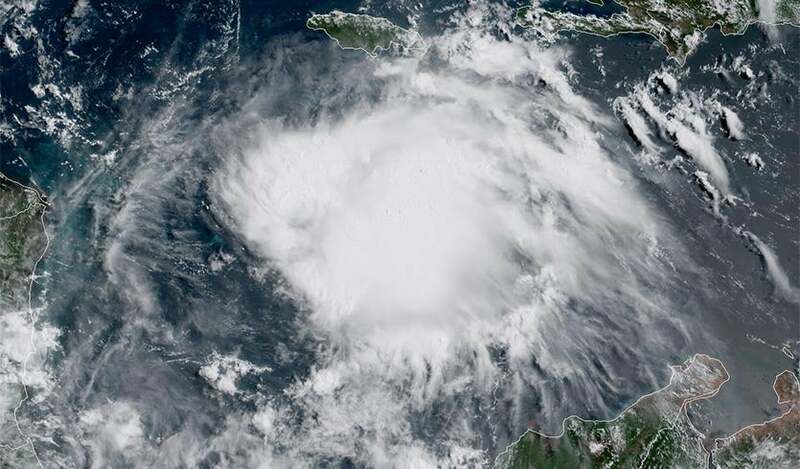 The Eastern Caribbean is a notorious graveyard for aspiring tropical cyclones, and it claimed another victim on Saturday afternoon, when Tropical Storm Harvey met its demise. On Friday, Harvey buffeted the Windward Islands as minimal tropical storm with 40 mph winds, dumping up to 8 inches of rain on Barbados, where some flood damage was reported. But high wind shear near 20 mph, combined with the accelerating east-to-west blowing trade winds that Harvey was embedded in, were sufficient to rip the storm apart on Saturday in the Eastern Caribbean. 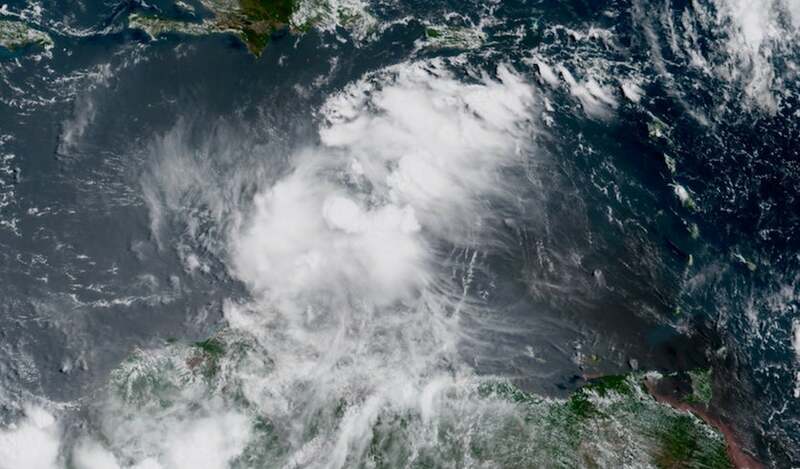 However, ex-Harvey is likely to regain tropical storm status at some point in the week as it heads west to west-northwest through the Western Caribbean, across the Yucatan Peninsula, then into the southern Gulf of Mexico’s Bay of Campeche. Satellite images on Sunday morning showed that Harvey was beginning to reorganize, with a decent-sized area of heavy thunderstorms that were increasing in intensity and organization. Wind shear was moderate, 10 – 15 knots, the atmosphere had a not-terrible-for-development mid-level relative humidity of 55 – 60%, and the ocean was warm, with sea surface temperatures (SSTs) of 28.5°C (83°F.) An Air Force hurricane hunter aircraft will investigate the system on Sunday afternoon to see if a closed surface circulation is forming. The atmosphere will grow moister and the SSTs will grow warmer as ex-Harvey progresses to the west. None of the 0Z Sunday operational runs of our three reliable global models for predicting tropical cyclone genesis—the GFS, European and UKMET models—developed the system before it made landfall on Tuesday morning in Belize. However, the UKMET and European model predicted development of ex-Harvey back into Tropical Storm Harvey by Wednesday, when the storm is forecast to be in the southern Gulf of Mexico’s Bay of Campeche. The 0Z and 6Z Sunday runs of the GFS model predicted that ex-Harvey would stay farther to the south and not have enough time over the Bay of Campeche to do much development. About half of the European ensemble members from 0Z Sunday, and about a third of GFS ensemble members, revive Harvey to tropical storm strength over the Bay of Campeche. In its tropical weather outlook issued at 8 am EDT Sunday, the National Hurricane Center gave ex-Harvey 2-day and 5-day odds of development of 50% and 60%, respectively. Regardless of development, northern Honduras, northern Guatemala, Belize, and portions of Mexico can all expect very heavy rains in excess of four inches from ex-Harvey, which will likely cause dangerous flooding and mudslides. middle of the week, where redevelopment appears more likely. Peninsula should monitor the progress of this system. Yucatan Peninsula should monitor the progress of this system. extends southeastward toward Puerto Rico and the Virgin Islands. northwestward over the central Atlantic at 10 to 15 mph. aircraft mission scheduled for today has been canceled. and the Yucatan Peninsula during the next couple of days. Florida and the adjacent waters. A. 6-HRLY FIXES ON HARVEY IF SYSTEM REGENERATES. B. CONTINUE 12-HRLY FIXES FOR SUSPECT AREA IF IT DEVELOPS. TCPOD 17-081 ALL CANCELED BY 21/1200Z. This could easily bring a foot of rain for parts of Texas !! !